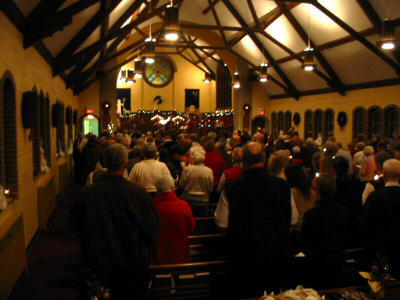 Wednesday evening, December 10, 2003 brought the annual candlelight service of Christmas carols and readings, enjoyed by the Summerlea / St. Andrew's congregation and friends from the surrounding community. Arrivals were greeted by Dale & Frank Romagosa and Irma & Frits Van der Veen. The choir under the direction of Summerlea music director Connie Osborne included members of the St. Andrew's and Summerlea choirs plus a few of their musical friends, with accompaniment by Tom Tucker on maracas for the rendition of "Come to Let Us Free" and John Osborne on flute for the "Lullaby to the Christ Child". The candles in the Advent Wreath were lighted by members of the Poitras, McKenzie, Overbury, Trudeau and Higgins families. Rev. Howard Clark delivered a message entitled "God's Fireworks", with some help from the younger set to illustrate the miracle of light in the darkness. Following are a few photos, most taken in low light and made visible only through the miracle of photo editing software. The combined and augmented choir readies for the opening processional under the direction of Undeg Edwards (Connie was up front at the organ). 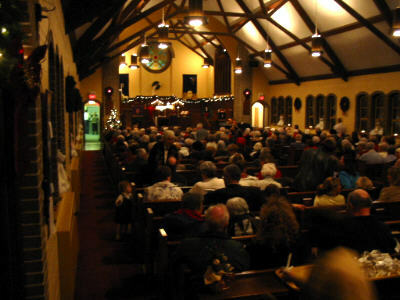 The sanctuary fills in preparation for the service. 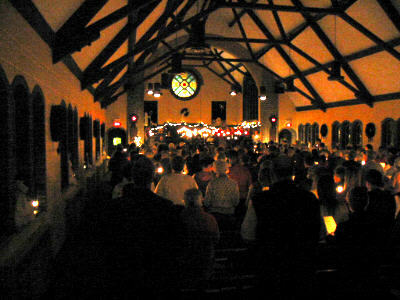 Singing "Let there be Peace on Earth" by candle light. Lights on again, some candles still alight. 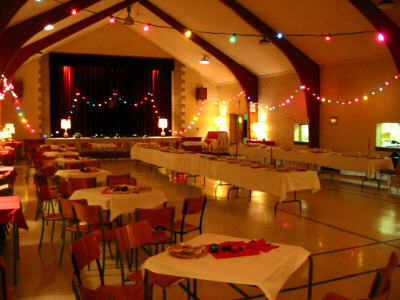 Acadia Hall awaits the throng after the service, with its decor and goodies prepared by the Serendipity ladies and friends (and Tom Pavlasek's festive lighting).